Bending steel is defined as deforming steel around a straight axis. Ogis specialises in CNC mandrel tube and pipe bending from as little as 6mm (1/4 inch) diameter up to 88.9 (3 ½ inch) diameter. We use specialised equipment and advanced technology to manipulate steel until it reaches a desired angle or shape – according to the application output. What projects can be completed? Steel bending allows custom manufacturing projects to be delivered. This includes transport grab rails, fuel lines, airport trolleys, ladders, handles, tap spouts, mining equipment, chair frames, street furniture and many other projects that we’ve delivered throughout more than 50 years in the industry. Some materials will want to spring back to their original form according to the memory of the used component. Every piece of material must be evaluated and taken into consideration when bending. We use a range of materials in our bending process, and in some cases, some materials will have to be excluded from the project to ensure its success – this however is communicated with the client during the design stage, prior to the manufacturing process. 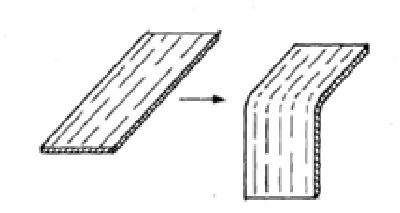 The curvature radius has an important impact on thickness variations. To avoid material fracture, we don’t go for bends with no inside radius. 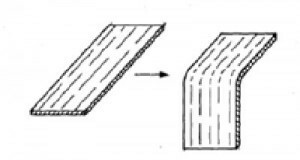 An ideal bend must follow specific directions, as it must always be performed perpendicular – or at most 45-degrees – to the grain lamination direction. Otherwise, the bent resistance is compromised, and the product is more prone to fracture. If you’d like to discuss a custom project, we provide fast & free quotes for all our advanced manufacturing services, talk to the team at Ogis Engineering today.